. : Farm Forest Line - Planting Trees to Reduce Waterlogging & Salinity :.  The tree species selected (water use, leaf area index, growth habit, etc).  Frequency and timing of recharge events (seasonal or only after particular rainfall events). Being able to match the potential of trees to particular processes occurring in a catchment can be a major challenge. 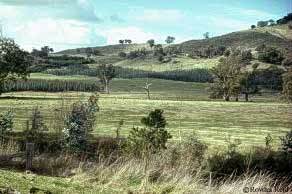 In many cases large areas of revegetation may be required on many farms across a region. In some cases, commercial tree growing options will be available that are attractive to farmers and allow them to convert large areas to perennial tree cover. However, in most cases the location where the trees must be grown for the control of salinity will be of low value for commercial tree growing due to low productivity, difficult access or the risk of drought and salt accumulation. For this reason a range of revegetation strategies are currently being explored including: growing trees in short term rotations with agriculture to dry the soil to depth, establishing trees in belts across the slope to intercept subsoil drainage, mixing trees with agriculture in belts or wide spaced trees; and establishing blocks of trees over shallow watertables.